Do you have a PPIE artifact? Laura's December 4, 2014 lecture at the California Historical Society recently aired on C-SPAN3. Watch a preview above, or watch the entire lecture on the C-SPAN site. 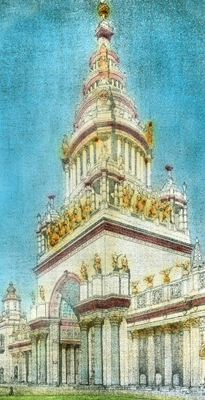 Welcome to the SF1915.com, the website for Laura Ackley's research on the Panama-Pacific International Exposition, or "PPIE." The site includes some background on the PPIE, information on lectures, publications and events and links to other exposition resources. The PPIE was the triumphant world's fair held in 1915 on 645 acres of the northern San Francisco waterfront now known as the Marina. The last American world's fair prior to the Depression, the exposition represented a pivotal moment in San Francisco history. The makers of the fair had two clear goals—celebrating the United States' success in completing the Panama Canal and the rebuilding of San Francisco after the Great Earthquake and Fire of 1906. At the fair's start, the U.S. had not entered World War I, but Europe was already embroiled in conflict, and the PPIE served as a site for rhetorical battles regarding possible involvement. The PPIE ran for ten short months, from February to December 1915 then was almost entirely dismantled, with the exception of the beloved Palace of Fine Arts, which endures in reconstructed and recently renovated splendor in its original location. However, the "Jewel City" had a powerful impact locally and nationally, influencing taste in art and design, and introducing a number of new technologies to its more than 19 million attendees. The fair's midway, dubbed "The Zone" hosted rides, historical re-creations and shows, not all of them wholesome. The exhibit Palaces and their adjacent courts showcased new ideas in landscape design, architectural color and an innovative illumination featuring spectacular effects including the "Electric Kaleidoscope" and the "Great Scintillator."